High-powered, pocket flashlights are trending upward in popularity thanks to the growing number of people who consider them a critical benefit to everyday life. This content is sponsored by SureFire. More and more, high-powered flashlights aren’t just found in the homes of most families, but in the pockets of an increasing number of individuals ranging from outdoorsmen and hunters to urban professionals, college students, frequent travelers, commuters and everyone in between. Flashlights like SureFire’s soon-to-be-released Stiletto, with its 650 lumens and slim pocket-worthy design, keep showing up in a common, daily ritual you might be familiar with: the evening pocket dump. These high-powered little lights can be found among items like loose change and pocket knives. Sometimes hankies and toothpicks are part of the mix too. The hanky tends to occupy a back pants pocket, the loose change usually assumes a front-pocket position and the toothpick often finds itself behind an ear — partially tucked under a well-worn cap — until its services are needed around lunchtime. And that’s OK. The Stiletto has its own go-to pocket for daily use. It fits nicely in the other vacant front pocket, thanks to a pocket clip that allows for quick and easy access. The Stiletto’s range as a multi-output LED is a feature that's particularly useful for hunters. The lightweight, handheld flashlight is rechargeable, weighs 2.8 ounces, and that weight includes the batteries. It’s only 4.45 inches in length. According to Persistence Market Research, high-powered, lightweight flashlights have become essential. Any doubt can be put to rest by this projection: Market research anticipates the global flashlight market will reach $8.2 billion by 2025. Why? For starters, there’s a growing demand for durable, low maintenance and efficient flashlights. This is coupled with other factors like innovation in flashlight products for outdoor activities, increasing preference for new features and advanced flashlights and advancements in illumination technologies. The research cites only a handful of key players in this surging market. 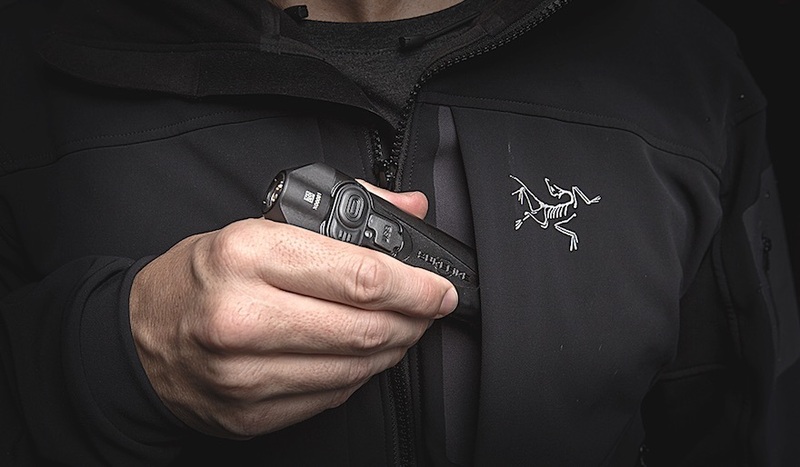 SureFire, known for its illumination tools and tactical equipment, is among this elite group of innovators. The company has been around since 1979, and the upcoming release of their newest pocket LED is timely. The Stiletto, a multi-output, rechargeable handheld flashlight, weighs 2.8 ounces, and that weight includes the batteries. It’s only 4.45 inches in length. The Stiletto’s range as a multi-output LED is a feature that makes the light particularly useful for hunters. So if you’re using the light for bloodtrailing, you can increase the light’s lumens between three settings to create a stronger, tighter output. But, if you’re looking to navigate the dark while you’re in the woods, climb a treestand or assume any other task that’s burdened by a lack of light, the Stiletto can be switched to low or medium output level. This pocket flashlight can be carried in addition to your headlamp or wrist light without adding weight to your pack. And the low output setting allows a hunter to complete small tasks on the stand without turning himself into an attention-grabbing tree ornament. The battery life is another advantage in hunting situations. If the flashlight is putting out 650 lumens — which is its highest setting — then you’ve got about 1.75 hours of battery life. But if you’re performing routine tasks or simply trying to navigate the dark in the woods, a hunter can get by with the pocket flashlight’s low setting. That’s still five lumens and, at that setting, the battery last a generous 30 hours. Finally, if you’re like most people, you’ve got micro-USB chargers laying around the house thanks to humanity’s reliance on smart phones and other modern, rechargeable electronics. Well, the micro-USB is all you need to charge the Stiletto. There’s relief in that. If you’re like many people, batteries are always on the shopping list. And it’s no wonder. The average household buys as many as 90 alkaline batteries a year. That’s the downside, presumably, to a modern life void of anything that’s analog. But it’s a downside that’s offset by rechargeable tools like SureFire’s pocket flashlight. After all, batteries are about 267,000 percent more expensive than household electricity based on a per kilowatt-hour measurement. The allure of the everyday flashlight also hinges on self-defense and its use as an alternative means of protection. Especially when other means of self-defense are restricted. It’s a flashlight. It’s allowed everywhere: on college campuses, planes, in secure places and facilities like football games, concerts and government buildings. Former Navy Seal Brandon Webb told Business Insider that a high-powered flashlight is one of the most important items he carries. The Stiletto’s pocket clip was designed for everyday-carry and quick access. It can be drawn as fast as a knife in stressful situations. There’s also an easy-access tail switch that activates the high-only output and high frequency strobe. So, the placement is ideal for someone in a threatening situation where quick and decisive action is critical. The Stiletto’s slim design allows it to be drawn and activated from a pocket as fast as a knife. It's a rechargeable, high-output handheld flashlight – ideal for anyone’s everyday carry kit. *All performance claims tested to ANSI/EMA FL 1-200 standard. High-performance LED and MaxVision Beam reflector projects a wide flood beam ideal for situational awareness. Benefit: The Stiletto uses the Cree XM-L2 which is optimum for the required output and runtime. Cree is one of the leading manufacturers of high-output LEDs. Body switch activates high, medium and low output for tasks. Benefit: End-users do not always need high-output. The low and medium output settings are optimized for frequent tasks requiring a minimal amount of light. The low and medium output settings are also optimum for battery runtime. Handhelds with more than three settings can be confusing and unnecessary. Tail switch activates high only and high frequency strobe. Benefit: End-users will have the benefit of high-only output on a tactically ideal switch location. The high frequency and high output strobe can be used to disorient a suspect or attract attention to the user. Mode switch allows end-users to change activation sequences and more. Benefit: Each individual end-user may have a preference on activation sequence for task lighting. The mode switch allows end-users to switch the sequence from high, medium, low over to low, medium, high. Integrated rechargeable lithium-ion battery with Micro-USB weather and dust resistant port. Benefit: End-users do not have to worry about acquiring extra batteries. Nearly every household in the US has MICRO-USB chargers so gassing up the Stilleto is a cinch. Compact, lightweight polymer body is weather resistant; Mil- Spec hard anodized aluminum heat sink. Benefit: The high strength polymer body and machined bezel is the right balance of materials to maintain the lowest weight possible (2.8 ounces!) The polymer body is ideal for bare hands in extreme temperatures. Robust pocket clip for everyday carry quick access. Benefit: Tactical handhelds need to be easily accessible from storage such as front pockets. The Stiletto’s pocket clip allows for bezel up front pocket storage so that it can be drawn as fast as a knife in stressful situations. Bonus: What’s a Lumen, Anyway?